'Buddha teaches that a loving heart is a powerful source of happiness. 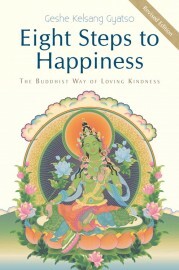 And Eight Steps to Happiness is a practical guide to developing this mind of love. Step one, “Learning to Cherish Others,” teaches how to "develop a realistic view of the world, based on an understanding of the equality and interdependence of all living beings. Once we view each and every living being as important we will naturally develop good intentions toward them,” writes meditation master Geshe Kelsang Gyatso.